A January 1 Newsweek article described the incident as Ahed “assaulting Israeli soldiers,” “threatening two Israeli soldiers and then hitting them in the face,” “pushing the soldiers as well as kicking them, hitting them in the face and throwing stones at them.” The piece referred to Ahed’s actions as “assaults” and an “attack.” It failed to report that Israeli soldiers had just shot and severely injured her 14-year-old cousin. CNN (1/8/18) also ran a piece that left out the most serious act of violence that day, as did Reuters (12/28/17, 1/1/18). An Associated Press report (12/28/17) had the same deficiency, leaving the false impression that the soldier was attacked without provocation. 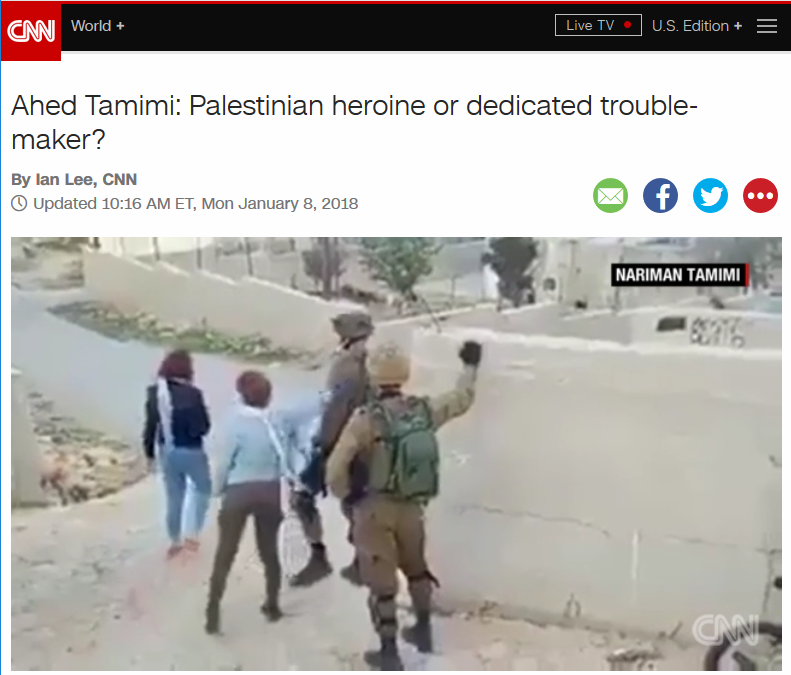 The Newsweek piece says Tamimi “has now been indicted on five counts of assaulting security forces,” and that she is “charged with interfering with the soldiers’ duties by preventing them from returning to their post.” It notes that “in May, she was charged with interfering with soldiers who were trying to arrest a protester throwing stones,” and refers to her indictment two other times, including in the headline. At no point does the article mention that the proceedings are taking place in a military court. 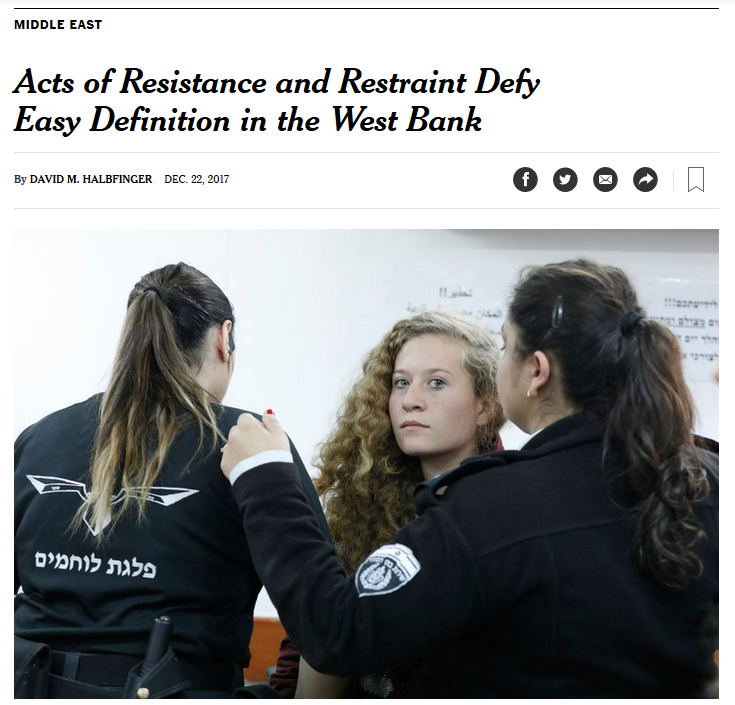 Similarly, an Associated Press(1/9/18) report refers to “Israel’s hard-charging prosecution” and “the charges” against Tamimi, without mentioning that she is being tried by the same occupying military that shot her cousin. Gregory Shupak teaches media studies at the University of Guelph-Humber in Toronto. His book, The Wrong Story: Palestine, Israel and the Media, is published by OR Books. Reprinted, with permission, from Fairness and Accuracy in Reporting. Photo: Ahed Tamimi (by Haim Schwarczenberg via Wikimedia Commons). Previous Article← A Second Korean War?